Cheesebox is a very nice canyon in the White Canyon complex. Stories were heard of it's complex difficulties, so once again, Brian and I took the fly, loaded up the packs with way too much gear, and headed down to southern Utah in the heat of the summer. We found few technical difficulties, but definitely found interesting and beautiful slots with enough strenuosity to humble our egos. This is a seldom-visited canyon in a wilderness setting, and is only appropriate for small, competent groups with good map reading skills. Route starts at a point on the Cheesebox Road and returns to the same road. A car-spot would save 2.8 miles of walking. 100' rope, extra slings and rappeling gear. Dry bags for gear. A few short rappels off natural anchors, a fair amount of moderate downclimbing, one or two rappels into pools and some swimming make this a moderate technical canyoneering adventure in a wilderness setting. Can be very wet and cold. Turn north off Highway 95 at milepost 66.8 (1 mile west of Frye Canyon Lodge or 2.8 miles east of the Jacobs Chair sign) onto the Cheesebox Road (San Juan County road 227a). Find your way down, then across White Canyon and up the other side. This is a rough 2WD road, and the worst spots are here at the crossing of White Canyon. Drive 7.9 miles to an area of open slickrock (UTM: 12S 0579941 mE 4169946 mN). Park here, this is where you will come out. Drive or walk another 2.8 miles to the start of the hike (UTM: 12S 0582171 mE 4173679 mN) a non-­descript spot in the Pinion/Juniper forest. 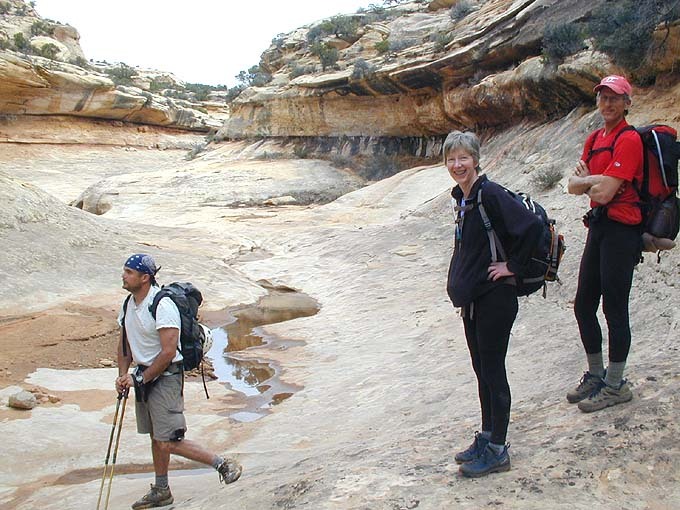 Hike due east to a prominent side canyon. Drop into the canyon and follow it. Keep your eyes peeled for ruins. At a large drop off, avoid rappeling like we did by following the rim left 1/4 to 1/2 mile to an easy downclimb to the canyon floor. The canyon soon starts cutting a slot -­ stay right and traverse the edge to an easy slot downclimb to the next level. A short hike leads to another short, easy downclimb into a nice set of narrows at the confluence with a side canyon. For us at least, this was the first comfortable shade. The narrows upcanyon are pretty neat. Narrows lead to more narrows, lead to... more narrows. Continue downcanyon, clambering over and under boulders, through short narrows and long. Several interesting sections can be downclimbed, and a few require short rappels. Natural anchors abound. A few short pools require some moderate wading, and at least one requires a short swim. The water is far from clean. Toward the end of this section, avoid a long, extremely gross looking swim by traversing the rim on the left (4th class/5.2). After extended drought in September 2009, we unexpectedly found not very much water in Cheesebox. One unnecessary rappel of 80 feet, then 4 rappels to 50 feet and 1 swim. Some fourth class, 5.2 climbing in the slots, plus to avoid the nasty last swim, plus some 4th class to exit the canyon. Dry conditions make it eight full hours including one hour for walking the road and one hour for a siesta. Then the canyon opens up and some trees and greenery offer a welcome respite from the rock canyon you have been following. Work your way up the layer-cake Cedar Mesa Sandstone on your right. 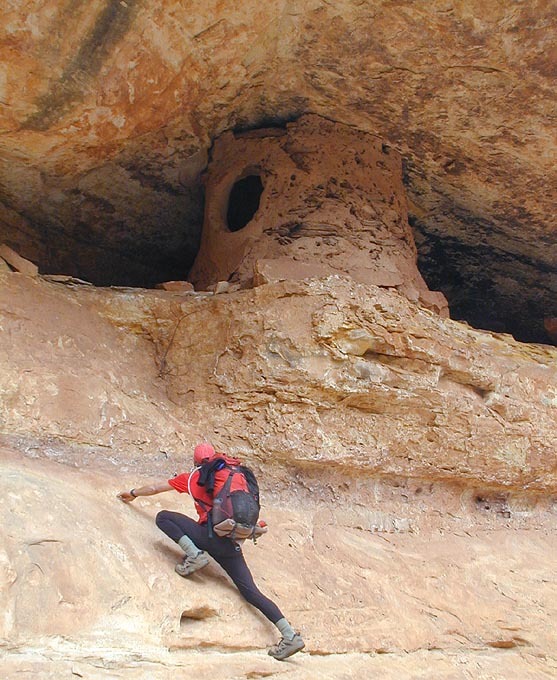 The first cliff is the most difficult and can be easily passed by hiking about 1/4 mile downcanyon to where a ramp allows moderate access upward. Weave your way through the remaining layers with the help of an occasional cairn. Once atop the rim, head directly away from the canyon to find the Cheesebox road and your vehicle. And the call went out throughout the Land: Many Days in March, Canyons to be Done, Old Friends and New. Come and enjoy. Bring lots of gear. Gotta do some of those Roost Canyons before the Hordes of the Prophet Kelsey descend upon the desert.